This is our breakfast today and is prepared by my wife and not me. Why I decided to write this is because I found that it is easy to prepare and delicious and is uncommon among my circles of friends. Looking at the picture, you may think that it is some sort of fried beehoon, in fact, it is not. It is quite healthy as it is using blanched ingredients (including beehoon) and no frying is needed. My wife prepared this at around 5:45 am for the eldest daughter for breakfast before she board the school bus at 6:30 am. 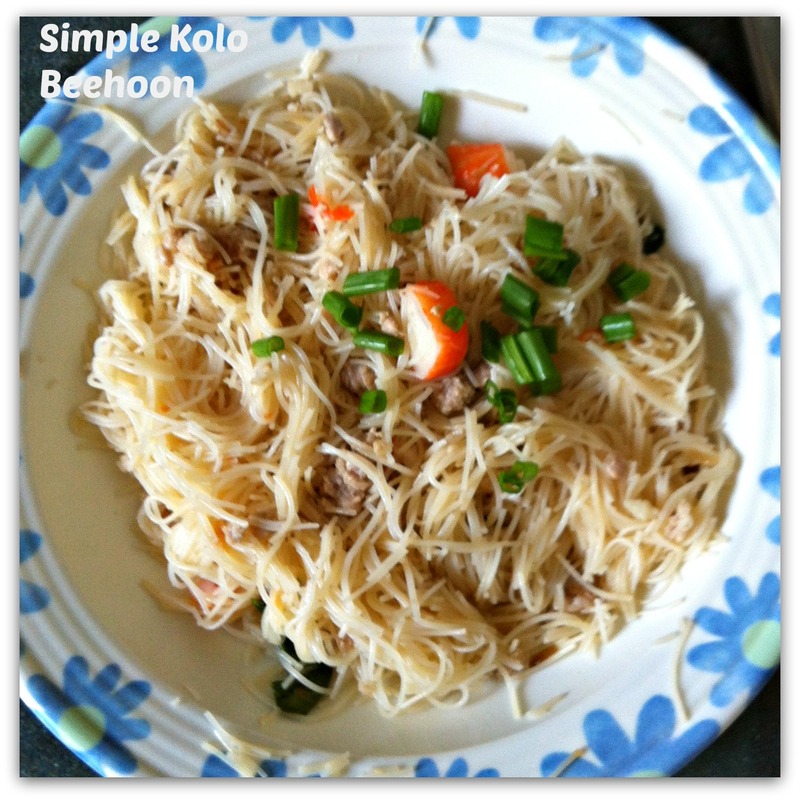 Beehoon is a type of dried rice noodles which is very common among the Chinese Communities in Singapore and Malaysia. Kolo in Chinese is called “干捞”, a process of cooking whereby you blanched all your ingredients and mixed it together to become a dish. In Kuching, Sarawak, Malaysia, we do have our famous delicacies Kolo-mee and the Sarawakians are having Kolo-mee for all meals from breakfasts to lunches to dinners and suppers. Usually, stalls that sold kolo–mee do have some variations for the noodles such as kolo beehoon, kolo kway tiao etc.… However, it was seldom prepared at home, at least, not at my parent’s home. Only after my two kids was born that my wife told us that she knows how to prepare this dish and claimed that it is very simple. Since then, occasionally, she prepared this when we are running out of breakfast ideas. Garlic and onion flavored vegetable oil We usually fried some garlic and onion in some oil and once turn golden brownish color, we will keep it in a bottle and let the fried garlic and onion submerged in the oil. We usually used it for dishes that we don’t wish to stir fry. Traditional way of preparation is using lard which is much tastier. However, this is considered as not healthy in the present context. Condiments Salt, light soya sauce and some flavor enhances that you used at home like mushroom concentrate etc. In Kuching, they have variations like adding tomato ketchup, lard from Char Siew (叉烧油), black soya sauce, white vinegar and is served with freshly cut red chili submerged in vinegar. Fresh leafy vegetables We usually add vegetables like Chye Shim, Bok Choi etc. Healthy to include this and have to role of negating the oiliness after taste if the noodle is too oily. Fish cakes /Crab sticks Both fish cake and crab stick were used because we have it readily in the fridge and the kids loved it. Minced meats A bit of minced meat for meaty flavor and can be substituted with Char Siew. Note: if you are vegetarian, just opt out of all meaty items. As for garlic oil, fried chop mushrooms in the oil instead. You can add taupok, vegetarian char siew etc..
Use the same pot of water to blanch the beehoon (water conservation! By the way, it make no sense as all you ingredients will be mixed together and boil water for individual ingredients will only increase your water and gas bills). In a big bowl, put some garlic oil but not too much if you are health conscious. However, I opt to believe that some oils are needed to smooth out the final texture of the mixed beehoon. Is it not the same principle applies to having olive oils when you prepare your salad greens? Put in the blanched minced meat and condiments such as salt, light soya sauce, mushroom concentrate, pepper, tomato ketchup etc. and stir until well mixed. You can add a bit of water to dissolve the salt and my wife likes to put a bit of Chinese black vinegar which is optional. Pour your blanched beehoon into the above and mixed it well. Add in all other remaining blanched ingredients, garnished with spring onion and the Kolo beehoon is ready. Cheap and tasty. Why not prepared it for tomorrow breakfast? Enjoy reading. 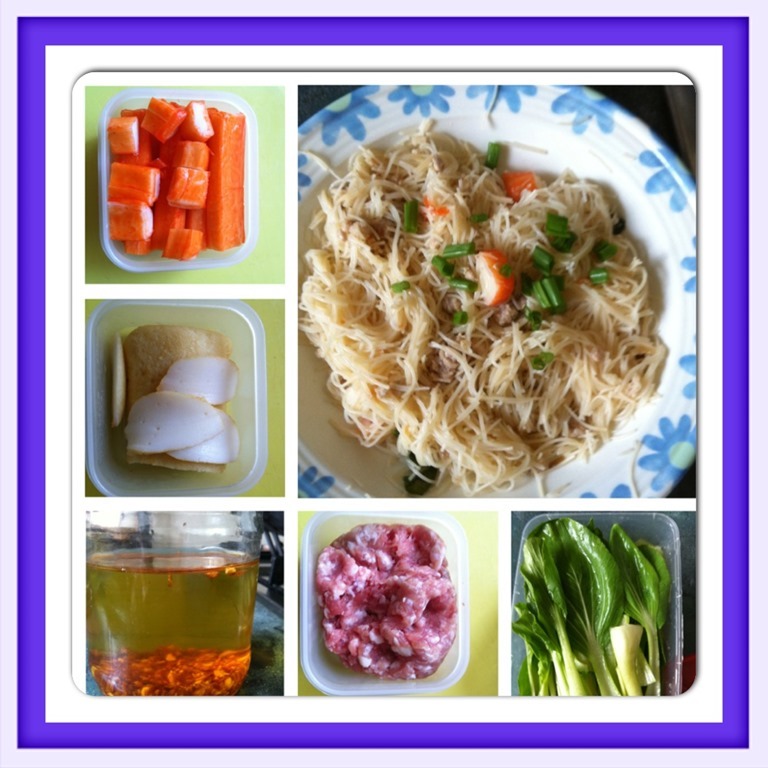 This entry was posted in Dish and tagged 8, breakfast, CHINESE, Chinese meals, delicacies, Food Preparation Series, home cook foods, kolo beehoon, kolo mee, kuching, malaysia, singapore. Bookmark the permalink.